Giving back is simply a way of life for Olen and Judy Hurst. In addition to helping rebuild a community, the couple established an endowment with a gift of retirement fund assets that will help support student missionaries at Oklahoma Christian University for years to come. The couple, who live in Stroud, relocated there in 1999 after a tornado had destroyed much of the town. Olen is originally from Oklahoma City and Judy grew up in Tulsa; neither had ties to the Stroud community. 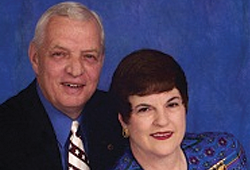 Following Olen's retirement from Kerr-McGee Corporation, the couple was moving back to Oklahoma from Houston with plans to buy a home in Edmond. As they drove through Stroud and witnessed the damage from the recent storm, they decided to move there instead to help rebuild the community. This is just one example of the couple's giving nature. A 1955 graduate of Classen High School, Olen attended Oklahoma State University where he received bachelor's and master's degrees in chemical engineering. In 1958, he and Judy were married and in 1971, he began a 28-year career with Kerr-McGee. The couple was living in Houston, where Olen was the director of international crude supply, when he retired in 1999. After moving to Stroud, the couple became very active in the community and helped to support the rebuilding of the Stroud Regional Medical Center, which had been completely destroyed by the tornado. Olen is currently the chairman of the Stroud Regional Medical Center Foundation, has served as president of the Lion's Club and in 2002, was named Citizen of the Year by the Stroud Chamber of Commerce. The Hursts have three sons, two of which attended Oklahoma Christian University. Through their experience with the school, they were moved by stories of students traveling on mission trips. "God has greatly blessed us, and in turn we wanted to help give back to these young people," says Olen. In 2011, through a gift of retirement fund assets, the couple established the Olen V. Hurst Oklahoma Christian University Fund at the Oklahoma City Community Foundation to support student missionaries. In appreciation, Oklahoma Christian University matched the Hurst's gift, doubling the endowment fund. Retirement plan assets are just one type of gift we can accept to help facilitate your clients' giving needs. For more information, please contact Joe Carter at 405/606-2914.